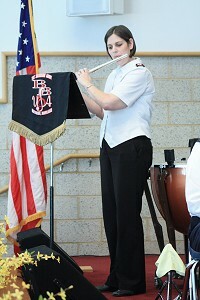 On the afternoon of Palm Sunday, 17 April 2011, at the Middle River Corps, the Baltimore Brass Band of the Salvation Army (Bandmaster Melinda Ryan) presented their Spring Festival of Praise. 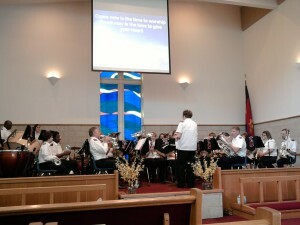 The concert began with Steven Ponsford’s Fanfare to Worship. Major Barry Corbitt, Baltimore Area Commander, gave words of welcome and the invocation. The concert continued with the march Salisbury City (Dean Jones) and Andrew Mackereth’s arrangement of the contemporary gospel song Above All. The audience was given a change to participate by singing Joyful, Joyful (arr. Leonard Ballantine). 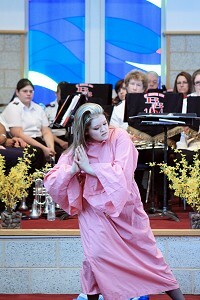 A special creative presentation, Alabaster Box, was given by Rebecca Pruitt of the Frederick Corps. A combination of silent drama and sacred dance, with a recorded musical backing, this item illustrated the story of the woman who poured out the alabaster box of oil on the feet of Jesus. The next item was Kenneth Downie’s moving arrangement of In the Love of Jesus, followed by the major work for the first half, Songs of the Pioneers (Kenneth Smith). Following an intermission, the band returned with William Gordon’s ebullient arrangement of the spiritual Joshua Fit the Battle. This was followed by another unusual item for a brass band concert – a flute solo. Captain Christy Nkanza, who has served in the horn section and is now in the percussion section of the band, originally learned the flute as her first instrument. 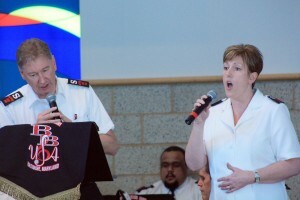 Major Karen Lyle led the congregation in another song, the glorious expression of saving faith, In Christ Alone. This was followed by an arrangement of a song appropriate for the Easter season, Jesus Paid It All (Brian Bowen). Major Rick Mikles and Major Lyle joined for a vocal duet, Glory, before Major Corbitt gave a brief devotional thought based on Revelation 21. Following Major Corbitt’s remarks, the concert concluded in a rousing fashion with Celebration of Contemporary Gospel Song (William Himes). This article was posted in News and tagged Baltimore Brass Band, Barry Corbitt, Christy Nkanza, concert, Karen Lyle, Melinda Ryan, Palm Sunday, Rebecca Pruitt, Rick Mikles on 24 April 2011 .